BUDAPEST, Hungary – Hungary's anti-immigration prime minister says the government is greatly increasing financial aid and subsidies for families with several children. Hungary needs a real border whereever one isn’t. Hungary is positioning itself against Islam and the EU. Regarding tax exemptions for large Hungarian families: I wholeheartedly approve. At some point, I would position Hungarians at the head of the line for immigration into the USA. This is huge. How many productive middle class families here in the US would have had more kids if they could afford them? For over two decades the left has been throwing up the argument; "We need immigration to combat the falling birth rate!". If this miraculously cures "the falling birth rate" in Hungary it will totally destroy the left's argument. What a great idea. I'd have 4 kids now if the US had the policy. Instead I pay 1/3 of my income to some nefarious entities that do little or nothing for me and mine and can barely afford 2. We do have a similar policy in the US, but it's for foreigners and single mothers: re tax exemption. Hungary's new policy is eugenic in that it produces more Hungarians and doesn;t need mohameddan immigrants to replace the population like the low fertility countries of France, UK, Germany, Sweden, Belgium, et al -- where feminism has taken hold with deep roots. Our policy and the policies of those countries named above is dysgenic, rather than eugenic -- ie bad for the herd. We are encouraging and even underwriting the reproduction of the lowest IQ segments of America and penalizing the higher IQ segments of the population by forcing them to pay for it all. America is not a nation any more. At 51 I was lucky enough to grow up when it was still a nation -- iE made up of mostly one ethnic group. Now it's a multicultural democracy thanks in large part to the Hart-Cellar immigration bill passed in 1965. We now have over 65 million foreign born 'American Citizens' who vote overwhelmingly for larger government and who don't believe in the Bill of Rights and who have absolutely no connection to Western culture, history, values, or even language. Combine that with ~30 million or so illegals and people here on various types of (job stealing wage decreasing) work visas and you have 1/3 of our population who are in no way American and have no connection to anything to historic America. Now it's considered a faux pax to suggest that aztec and incan immigrants learn English. In America. Going off the rails on the crazy train, indeed. What's coming was described by one Enoch Powell back in the 60's, or worse, Raspail's Camp of the Saints. Nations are homogeneous groups of people who share culture, language, religion, and ethnicity. The USA is not. And it is doomed to either Balkanization (if Whites wake up in time) or something that looks like a Spanish speaking South Africa with mosques here and there. We're at a tipping point demographically right now. The majority of 10 and under kids in the USA are not White. THE MAJORITY OF 10 YEAR OLDS AND UNDER IN THE UNITED STATES OF AMERICA ARE NOT WHITE. What does that portend for the future? For us? For our posterity? It ain't good. In fact it's pretty damned dark. Imagine life in the US if productive families had been subsidized and encouraged to raise more productive kids? Foothiller - where you grew up there might have been "mostly one ethnic group" but where I grew up in a farming and fishing area of the California central coast my Mother's church had 33 different national backgrounds at our "Christmas around the World Dinners" from Japan to Persia; and some of those families (especially the Italians, Hispanics, and the Japanese) had been there for at least a century or more. The mostly Danish town of Solvang wasn't too far away and even San Luis Obispo had a small China Town where at least one family had owned a shop since around the 1880s. What we didn't have were a lot of African-Americans; we had one family whose Dad was a local GP and later a lawyer's family but that was about it. Believe it or not, I didn't realize Japanese was an "ethnic minority" until I was graduate school in Mississippi and I my major professor mentioned his housemate (a six foot two third-generation Japanese American) was from a "minority group." I feel like an idiot now, but to me, Japanese was just my next door neighbors with the cattle ranch and whose dog "Cobbie" (Red in Japanse) adopted me and eventually they gave him to me (despite him probably being worth a lot of money). My point here is that "Americans" really ARE a Nation of Immigrants - LEGAL immigrants - but depending on where you live you may or may not realize that. That's because people tend to settle in areas that remind them of home when they can manage it and take up trades they had at home-so Colorado has "Welsh Walls" all over the mountains (the same as they have in Wales) built by minors who did the same jobs in both places, central California is full of Italians growing olive trees and Minnesota full of former Scandinavians and their knitting patterns. Island people from the Carribean tend to settle in Florida or the Gulf Coast, and many Latinos live in the same areas their ancestors (I had a workmate whose family had been in the San Luis Valley Colorado for 500 years). Because illegal immigration is a problem in the modern world and is a problem that must be faced, does not erase the fact that the vast majority of people who are "natural born" Americans had families that came from somewhere else - some of them 50,000 years ago but the majority a lot more recently. Go watch the old mini-series Centennial if you want a pretty good idea of what the 19th century far West probably sounded like in terms of accents and mish-mash of people - or read the book by James Michener. It was written before modern politics decided what parts of history were "acceptable" either by the political left or the political right - he just went and look at the historical records and used his imagination from there. My view is that the intentional revising or forgetting of history is never a good idea; no matter whose modern agenda it may support - that is as true when it comes to taking apart idiots who think the depopulations of the Americas by Europeans caused the Little Ice Age as it is for "inconvenient truths" about the history of US immigration. There WERE periods when legal immigration was effectively closed in the United States, there were also times when certain ethnic groups were barred (the Chinese for one) and I'm not ignoring that either. Dealing with the modern problem of illegal immigration should not be used to re-write the past; that never ends well for the future no matter which "side" does it. "whenever any Form of Government becomes destructive of these ends, it is the Right of the People to alter or to abolish it, and to institute new Government, laying its foundation on such principles and organizing its powers in such form, as to them shall seem most likely to effect their Safety and Happiness"
There's a major dispute on migrants between Hungary and the EU or rather, on the resolution of Europe's demographic issue through migrants. Prime Minister of Hungary Viktor Orban is a severe irritant for Brussels just because he refuses to make up for Hungary's population decline by inviting migrants. Instead, Orban announced a large-scale pronatalism program in his country under the slogan "We need more Hungarians." A few days ago I posted a free free download thread. Basically this book uses demographics to destroy the progressive liberal/globalist argument that: there must be mass immigration due to a falling birth rate in first world countries. Basically according to the book; the birth rates are falling below the replacement rate for secular liberals. The birth rate is increasing for females who are members of conservative Christian and Jewish sects. The author posts sources for data verification. Stats from Poland, Hungary and other European Countries rejecting Eu immigration quotas and supporting traditional Christina values are featured. Even here in the US the pattern also repeats with conservative Christian women having more children than secular liberal progressives. Who'd a thunk it? SJWs and femminNAZIs aren't having kids? I like the author's premise but think some of his extrapolations are naive because while they may be mathematically correct there are other limiting factors don't appear to be taken into consideration. What you subsidize, you get more of... the FUSA could learn some lessons here. The Democrats figured this out decades ago. Russia and Putin initiated a similar birth incentive program, some number of years ago - we discussed this on TB2K, at the time. Russian President Vladimir Putin congratulated Russian women for everything they do in life, like taking care of the home and staying beautiful. He made the remarks to a group of Russian female policewomen on International Women’s Day, which was celebrated throughout the Soviet Union. 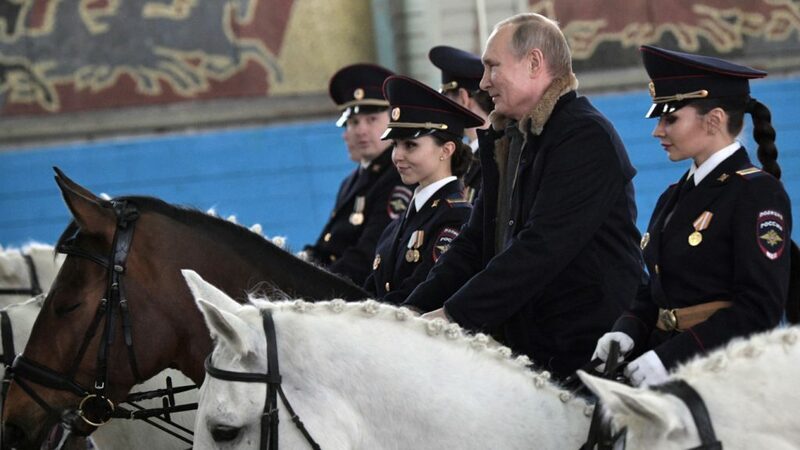 Putin also told the female police staff that when they patrol the city woodland parks, the number of accidents drops “because those who wish to commit suicide look at you and want to live again,” reported The Moscow Times.